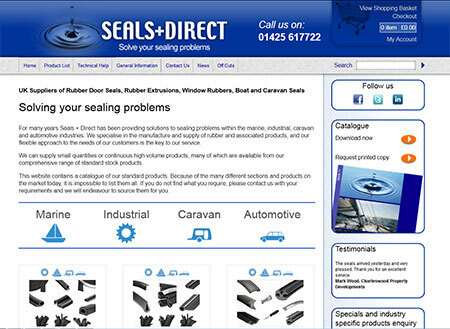 Seals Direct are a Hampshire based business that specialise in sealing solutions in many areas such as marine, industrial, caravan and automotive industries. When they started out their e-commerce website funtioned effectively, however, as the business grew the processing of orders became increasingly time consuming, as orders had to be inputted manually into sales and invoicing systems respectively. The orders would be taken on one system and then converted to another so that if the company wished to reference or bill customers they would have to manually search the system for the order. So as their business grew further, it became imperitive that they found a new solution that would also house a back-office system for invoicing and shipping. Radikls set about designing and implimenting a new e-commerce system, which was able to simplify the task of handling customers orders. We did this by incorporating a dedicated server for storage and retrieval of sales data. This meant that order information could be easily retrieved for invoicing, labeling and repeat custom. And to make repeat purchases easier, Radikls also installed an account system so that customers could reorder any item that they had purchased previously. The new system has proved to be a much more efficient way of dealing with online orders. Seals Direst have put the time that they have saved in processing orders to use in other areas of the business and have since expanded. Indeed the increased efficiency has enabled them to move into bigger facilities while maintaining their existing staffing levels. "Using Radikls has certainly improved our efficiency and they are always happy to look at any ideas we may want to add to our existing system".